Natural Beechwood Smoked Pork Frankfurters. 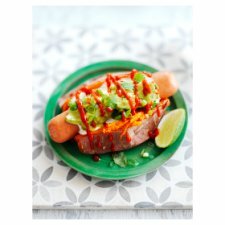 Herta Jumbo Frankfurters are smoked with natural beechwood for extra flavour and can be simmered, fried, grilled, microwaved, baked or barbecued. 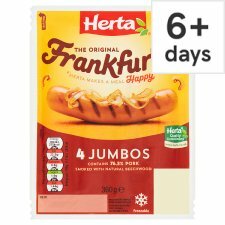 Did you know that Herta Jumbo Frankfurters are great on the barbecue? 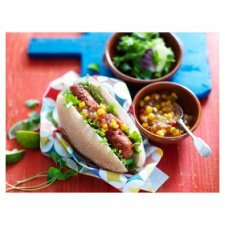 Serve up in a roll with mustard, ketchup and fried onions or create your own combo! Keep refrigerated, Once opened eat within 2 days, Suitable for home freezing. Freeze on day of purchase. Defrost thoroughly before use. After defrosting keep refrigerated and eat within 2 days. Do not refreeze. 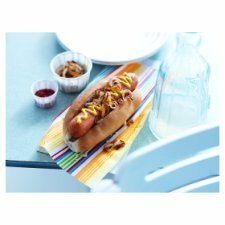 Microwave (From Chilled): Heating Category E 850 W. Place 1 Jumbo Frankfurter on a microwavable plate and cover. Cook on Full Power for 1 min 10 secs. Leave to stand for 1 min before serving. Shallow Fry (From Chilled): Fry in a little hot oil over a moderate heat for 7 minutes, turning frequently.